Doesn’t that look great. I had a hard time piling it all on my kitchen trolley. Look at that lovely fish- two Haddock and an organic Salmon courtesy of O Driscolls fishmongers and The Ballycotton fish guys.The haddock was baked with a red pepper butter and served up for saturday nights dinner with sauted baby mushrooms and spinach. The salmon was boned out (bones made a stock) and cut into piece which will go really well with the bag of watercress from Tobias at Noinin Herbs. Tobias also provides us with our fresh coriander which is amazing. You know how supermarket bought herb packets go all mushy and slimy after a few days in the fridge. Tobias’s lasts for weeks -it just dries out a bit. Thats growing things organically for you.The coriander will flavour our curry this week and I’ll make a batch of cheesey coriander cornbread one day. I also got a bottle of his Cinnamon leaf oil as I love the smell of cinnamon ( it helps suppress sugar cravings -we are on a healthy eating jag) and his oils are very good quality. 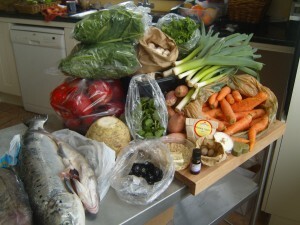 I picked up the spinach, celeriac, carrots, leeks and shallots from Organic Steve. He had homegrown baby leeks so I picked up a bunch for mom for mothers day. Weird present you say. Well shes always on the lookout for baby leeks to make Belgian Leeks with- its one of her favorite dishes. I figured that would make a better present than flowers or candy. For Belgian Leeks you wrap the leeks in ham and bake them in a white sauce. Love It. The celeriac and carrots are this weeks healthy raw lunch veg and tomorrow we are turning a bunch of the carrots into Zesty Carrots . Parboiled carrot sticks baked in a horseradish mayonaise . Absolutely excellent ,especially with beef. Lots of mushrooms from the lovely Nicole . Big ones are stuffed, small ones are sauted in olive oil and garlic and then chopped spinach is added . Yum. Black Morrocan Olives from Toby at The Real Olive Co. are a staple in my fridge as they are so flavoursome a little goes a long way . They will be added to salads and breads and sauces all week. Lots of juicy Jonared apples to keep us fruited up from Adam at Kilowen Orchard. When we run out of our own apples these are the only ones we eat for the rest of the year. See the tiny green heartshaped soap in the corner (bottom right ) and the wee bath bomb that looks like a cupcake. These are from Jasmine at the Sunvale Soap Company. 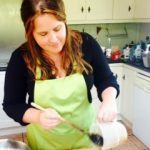 She’s our go to soap girl.I love all her stuff -her soaps and her homemade lipbalm and Bath bombs especially. Her super footcream is just the ticket for sandal feet. Peter from Country Choice provided me with my packet of Spanish pinenuts (no pinenut mouth here). He also very kindly shared his yummy sandwich lunch. Since I had forgotten to eat as I was talking too much(often happens) that was much appreciated.It was a cheese, ham and marinated mediteranean vegetable roll using their products. Lovely. Finally I picked up fresh nutmegs and a pack of Masala Gohst curry spices from The Green Saffron. Arun has us spoilt for lesser spices now -theres nothing like his fresh nutmegs, and I can’t wait for thursday as its Masala Gohst day. 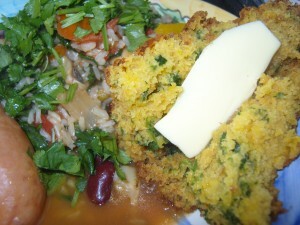 I love reading your blog but it always makes me hungry!